Notice is hereby given that a meeting of the Board of Directors of the United States Judo Association will be held on the 31st day of March 2017, at One o’clock (1:00) P.M., at Kodokan Judo of Cape Coral Dojo, 532 SE 47th Terrace, Cape Coral, FL 33904. USJA President John Paccione is pleased to announce that International A Referee Gary Berliner, 8th dan has accepted the position of Head Referee for the USJA. Gary is a member of the NGB’s Referee Commission and was a referee at the Rio (Para) Olympics last summer. Bob Rush from CEM Judo in California has joined the Board of Directors to fill the seat left by the passing of Michelle Holtze. We welcome him and look forward to working with him. RIO DE JANEIRO — American Kayla Harrison has another gold medal. Call it one more for the road. Expected to retire following these Olympics and become the next female star in professional mixed martial arts, Harrison defeated France’s Audrey Tcheumeo to win a second judo gold medal in the 78-kilogram weight class in front of a disappointed Brazilian crowd that was hoping to watch Harrison take on Mayra Aguiar. Harrison, 26, had predicted a matchup with Aguiar more than a year ago as the two have been longtime rivals and had split their first 14 meetings. It would have recalled echoes of 2012, when she beat Britain’s Gemma Gibbons in London in the gold medal match. Instead, she faced Tcheumeo and did not seem to be getting the best of the action until the final seconds when she finally got Tcheumeo on the ground for a decisive win by ippon. Harrison rolled into the semifinals, defeating Anamari Velensek of Slovenia in 1 minute, 43 seconds with an armbar move that immediately ended the match. Her earlier matches weren’t any longer, confirming her dominance in this tournament. When Kayla Harrison returned home with two Olympic gold medals she had something special waiting for her. 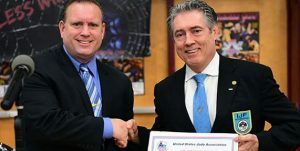 On August 31st the United States Judo Association’s promotion board had decided to reward Harrison with the rank of Rokudan, sixth degree black belt. The USJA promotion board, comprised of multiple Olympians, decided this not only on her competitive prowess but her embodiment of the principles of Judo. 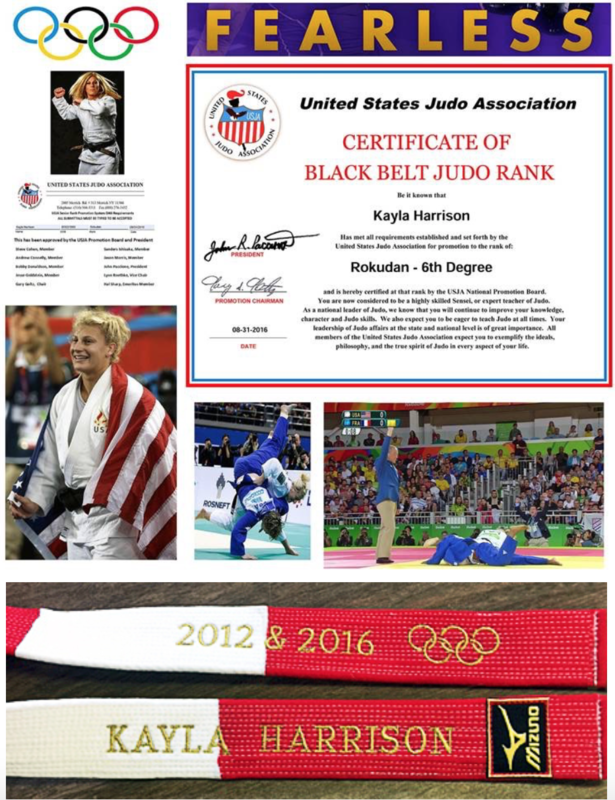 The United States Judo Association is proud to promote Kayla Harrison to Rokudan and support her as one of the best ambassadors of our art. This week the United States Judo Association would like to highlight our new customized email preferences! You can change your email preferences simply by logging into www.usja.net with your username and password. Once you arrive at your Dashboard, locate and click the “My Profile” button in the top right of the screen. This will take you to your personal page. In the profile detail box click the “Edit Info” button near the bottom of the table. From here you can edit your personal information. To continue to the customized email preferences keep scrolling down until you reach the “Notifications” section. You can select what type of events you’d like to stay updated on: Tournaments, Camps, Clinics, Scrimmages, and Other. You can also select the states you’d like to receive the notifications from. This way you can stay up to date on regional events near you. If you want to be notified of all events across the country to see what’s going on, simply keep all the boxes checked. We hope you enjoy our new features. Our goal is to increase the efficiency and effectiveness of our system. This benefits our members and coaches by providing quick and convenient solutions to help minimize excess work. We appreciate everything our members and coaches do for us. Stay tuned to see more of our upcoming features! We place high value on education, both on and off the mat. To show how much education means to us, we have partnered up with the National Honor Society to provide free membership to all of our honor students. We are proud to recognize and reward our members who have put time and effort into their studies. To qualify for the free membership, all you need to do is attach a copy of your National Honor Society certificate (http://www.nhs.us) to your membership application form and you will receive a full year of free membership with the United States Judo Association. On behalf of the staff and volunteers of “your” United States Judo association, we wish you all a Merry Christmas and a happy and healthy New Year. Over the past year, many of our members have asked about a reduced Life Member package and we are pleased to bring back the very popular package that we extended last year. If you chose a Life Membership before your current membership expires, we will extend the first year of your Life Membership to the new date of you application. In addition, you will be covered by the USJA’s liability policy and the excess medical insurance policy. Life Membership requires an annual sustaining life membership payment of $30.00 per year, after the first year in order to keep the membership active; that is a 40% annual savings for life. You can also choose to buy the life Membership for $245.00, which will then include the new USJA Senior Guide (a $50.00 value) in the final bound editions. The Guide is the essential requirement for USJA senior rank information and promotion that every senior member and every instructor must have. To take advantage of this offer please call us during our office hours! USJA’s liability insurance company is asking every instructor, assistant instructor, indeed all persons who assume some oversight or trai ning responsibility (eg. Black belts) should take the U.S. Center for Disease Control’s free on line COACHES training at http://www.cdc.gov/headsup/youthsports/. The on line course takes between 30 and 45 minutes to complete followed by a short quiz. When you finish the training you will be able to complete an easy test and after successful completion, download and print a Certificate of Completion. Please send a copy of that certificate to the national office by fax or email (you can also send a copy through the post office). I have asked Mike Szrejter and Ed Thibedou of the Coach Education to take immediate steps to include the CDC Heads up training in all future Level 1 training classes in order to comply with this very serious issue.